Come, O thou Traveler unknown, whom still I hold, but cannot see! My company before is gone, and I am left alone with Thee; With Thee all night I mean to stay, and wrestle till the break of day. I need not tell Thee who I am, My misery and sin declare; Thyself hast called me by my name, Look on Thy hands, and read it there; But who, I ask Thee, who art Thou? Tell me Thy name, and tell me now. In vain Thou strugglest to get free; I never will unloose my hold! Art Thou the Man that died for me? The secret of Thy love unfold; Wrestling, I will not let Thee go, Till I Thy name, Thy nature know. Wilt Thou not yet to me reveal Thy new, unutterable Name? Tell me, I still beseech Thee, tell; To know it now resolved I am; Wrestling, I will not let Thee go, Till I Thy Name, Thy nature know. 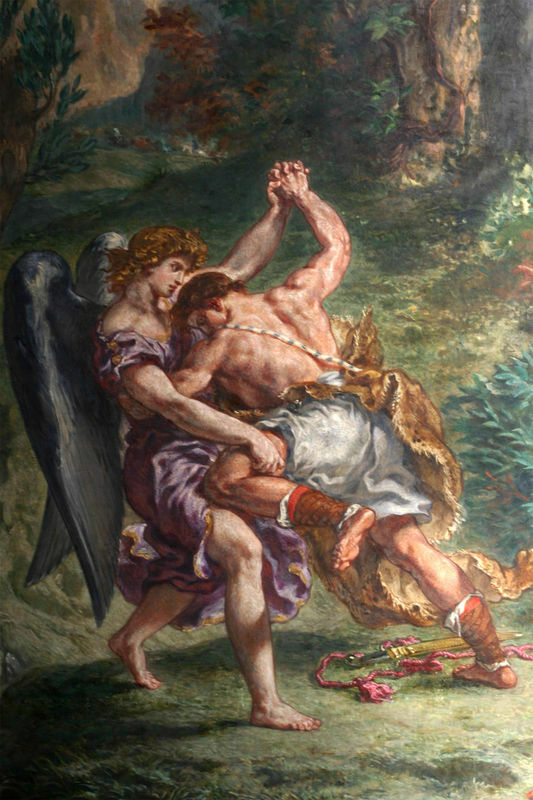 ’Tis all in vain to hold Thy tongue Or touch the hollow of my thigh; Though every sinew be unstrung, Out of my arms Thou shalt not fly; Wrestling I will not let Thee go Till I Thy name, Thy nature know. What though my shrinking flesh complain, And murmur to contend so long? I rise superior to my pain, When I am weak, then I am strong and when my all of strength shall fail, I shall with the God-man prevail. My strength is gone, my nature dies, I sink beneath Thy weighty hand, Faint to revive, and fall to rise; I fall, and yet by faith I stand ;I stand and will not let Thee go Till I Thy Name, Thy nature know. Yield to me now, for I am weak, But confident in self-despair; Speak to my heart, in blessings speak, be conquered by my instant prayer; Speak, or Thou never hence shalt move, And tell me if Thy Name is Love. Tis Love! ’tis Love! Thou diedst for me! I hear Thy whisper in my heart; The morning breaks, the shadows flee, Pure, universal love Thou art; To me, to all, Thy bowels move; Thy nature and Thy Name is Love. My prayer hath power with God; the grace Unspeakable I now receive; Through faith I see Thee face to face, I see Thee face to face, and live! In vain I have not wept and strove; Thy nature and Thy Name is Love. I know Thee, Savior, who Thou art. Jesus, the feeble sinner’s friend; Nor wilt Thou with the night depart. But stay and love me to the end, Thy mercies never shall remove; Thy nature and Thy Name is Love. The Sun of righteousness on me Hath rose with healing in His wings, Withered my nature’s strength; from Thee My soul its life and succor brings; my help is all laid up above; Thy nature and Thy Name is Love. Contented now upon my thigh I halt, till life’s short journey end; All helplessness, all weakness I On Thee alone for strength depend; Nor have I power from Thee to move: Thy nature, and Thy name is Love. Lame as I am, I take the prey, Hell, earth, and sin, with ease o’ercome; I leap for joy, pursue my way, and as a bounding hart fly home, through all eternity to prove Thy nature and Thy Name is Love.